Guyana’s dangerous ‘fun’ politics – WHERE in our Caribbean Community but in Guyana can be found a major political party that seems bent on making a mockery of governance politics? I refer to the antics of the People’s National Congress (PNC). There are occasional examples of strange tactics and behaviour and sheer fun politics by both ruling and opposition parties across the region. But the PNC, a major party in the pre- and post-independence governing politics of Guyana, appears to have made a vow to sustain fun politics for as long as it takes to regain the reins of state power. Having run the affairs of Guyana in a virtual one-party context for a quarter century between 1968 and 1992, based on independently verified rigged national elections, the PNC remains committed to the politics of non-cooperation and, worse, hostility against the governing People’s Progressive Party (PPP), its traditional competitor for state power. Some recent examples should suffice: First, the PNC’s refusal (along with its parliamentary ally, Alliance for Change) to cast their one-seat majority vote in the 65-member parliament for enactment of a much-needed amendment to a 2009 piece of legislation—the Anti-Money Laundering and Countering Financing of Terrorism Bill. Failure to do so by this May 29 will result, as the PNC is fully aware, in Guyana being earmarked for “blacklisting” by the Caribbean Financial Action Task Force as a non-cooperative jurisdiction. This would have enormous negative consequences. Conscious as they are of the shared consequences within Caricom, the Georgetown-based Community Secretariat, as well as the Organisation of American States is pleading for cooperation for passage of the bill, but to no avail. However, as negotiators of the task force have made abundantly clear, the demands by the opposition were extraneous to the revised bill and related more to domestic politics which they are not involved in. It may be of interest to know that among the demands by the PNC, which have nothing to do with provisions in the amended legislation, are such domestic political issues such as arrangements for local government elections. The PNC seems bent on further injuring itself by showcasing how consistent it could also be in non-serious, indeed fun politics in another issue of national importance. This time it relates to the current enquiry into the assassination 34 years ago of the historian and crusader for social justice, Dr Walter Rodney, in a bomb blast in Georgetown at the height of nationwide political disturbances. I have dealt with this issue in earlier contributions in the Express. For now, I will restrict comments to the recent decision by the PNC to boycott participating in the probe involving three well known Caribbean legal luminaries, first after quibbling over the terms of reference. What is so amusing about this stand by the PNC’s leader is that the “all” he plans to do to avoid any real or perceived “sullying” of his party’s “good name”, does not include what seems elementary—to participate in the independent probe like its junior partner, the WPA, which itself is viewed as an aspect of Guyana’s fun politics with the PNC out in front. But in Guyana’s quest for much-needed political stability and progress, this is simply a season of dangerous fun politics. The PNC has made Parliament an old McDonald Farm, it seems. They drum, make noise to drown out Minister Rohee’s voice. It is cricket in the jungle and jackass is bowling. I’m sorry but I refuse to take you or your article serious simply because you are bias, non-ojective collumnist. You sit around in a black dominated, accountable to its people, democratic society and sprew your nonsense without really experiencing or understanding the magnitude of the corruption, crime and mismanagement of the whole damn country from there. 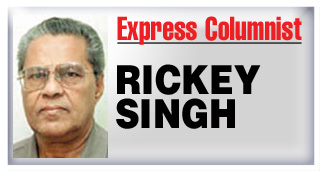 Oh, common Mr Ricky…all this bitterness after all these years..?? Ow, man…people like me who have suffered under the PNC and now suffering under the PPP just look to the GREAT CREATOR and “Count our Blessings”. The politicians, they come and they go. But We, the ordinary people, live our lives in happiness, in spite of all the beating-up we get every day…we still feel Blessed. You, Sir, have been blessed, too, So just count your Blessings. BTW, I’ve not seen you in many moons…stan good, Bro.